When the word da’wah is mentioned, we are generally talking about enjoining the good (Al-Ma’roof: Islamic monotheism and all that Islam orders one to do) and forbidding the evil (Al-Munkar: Polytheism, disbelief and all that Islam has forbidden) to Muslims as well as non-Muslims. 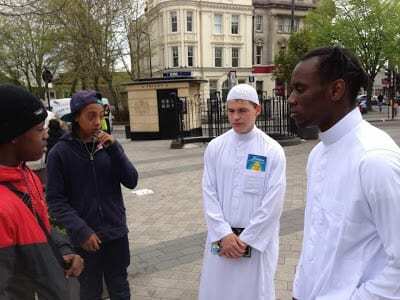 Now this da’wah can take a variety of forms including directly though a conversation with someone about Islam, and indirectly through distributing a leaflet, CD, or book about Islam. Therefore, it is not limited to one format or group of people. This is something we will, In sha Allah, address in a second article about how we as productive Muslims can give da’wah. But first, I thought it would be good idea to look at some of the many benefits we can derive from taking part in giving da’wah to help boost our participation in this great act. This beautiful hadith highlights the massive reward of completing the obligatory acts that can motivate us to carry out this important duty. In contrast, it is worth considering the consequences of neglecting something that is obligatory upon us. For example, we understand Allah has prescribed 5 daily prayers and the severe consequences we may face for missing just one of those prayers. Consequently, we should give great consideration to da’wah before abandoning or even neglecting this and therefore look to making it part of our lives in some way, shape or form. The occupation of the Prophet Muhammad along with all other prophets was to be a Da’ee (caller to Islam). For us to be given the opportunity to follow in the footsteps of the greatest man to have ever lived is a huge honour and favour given to us by Allah . As we are followers of Muhammad , the responsibility of continuing this work falls on our shoulders, which is something worth remembering. So we should try to keep in mind of whom we are imitating by giving da’wah. In sha Allah, this will inspire us to continue with this important duty by following the one who should be more beloved to us than ourselves. It can be easy to say ‘I like or love that person’, but proving that affection can only be done through actions which can involve telling others about the qualities of that person and emulating the ways of that person. As they say: actions speak louder than words. Through helping someone revert to Islam or return to practising Islam, In sha Allah you will find that person being a happier individual than before. As an expression of gratitude, it is often likely that a person will personally thank you. Hopefully they will also remember you in their supplications for being there to give them valuable advice, offer support and pass on beneficial knowledge to help direct them to the straight path. This highlights the great rewards that can be achieved through giving da’wah and passing on useful knowledge to others. Being remembered in the supplication of others is something we should all want to have. It is a bit of a cliché when people talk about the state of the Muslim world and the attacks by the media etc. But for change to come about, we would need to change ourselves and look at what we realistically are able to achieve. This can involve little changes for example giving da’wah to a non-Muslim colleague about Islam or looking at our own areas of weakness as individuals and looking to rectify those weaknesses with the help and grace of Allah . We cannot change the world individually and Allah is not expecting us to either. However, we should try to strive and impact positively on our local environment and society with whatever skills and abilities He has blessed us with. I am sure we would wish to see those around us, such as our friends, family and neighbours, from being of those that are pious and righteous. In sha Allah sharing this beautiful way of life with others will go a long way to making this happen. It is commonly mentioned by those involved in da’wah that the first person to benefit from the knowledge passed on is yourself. Through continuously passing on the message of Islam and reminding others of the greatness of Allah , In sha Allah you indeed strengthen your belief and relationship with Allah and His chosen way of life. Consequently, this helps to prevent you from becoming neglectful of Him. Many Muslims are excellent when it comes to performing the rituals of Islam e.g. fasting, zakat and salah etc., which is great. However, continuously performing rituals without adding to them can cause you to become stagnant and possibly act as a barrier to strengthening your relationship with Allah . Take the example of a person who always lifts 10kg with the same amount of repetitions each time. Is that person likely to get stronger? The person may not become weak, but he will not become stronger either. We as Muslims should strive to push ourselves to do better. A higher level of faith is likely to lead us closer to Allah and therefore offer us greater rewards and as a result, make us winners in this life as well as the hereafter. Furthermore, we can have a look at those who were strongest in faith in Allah which includes the Prophets and the companions of Muhammad for proof of this. Their lives were full of sacrifices for Allah in terms of their time, health and wealth and this contributed to them being of the closest to Allah , and not necessarily due to the quantity of prayers performed and Qur’an read. Just adding to the point of not being stagnant, a sheikh recently mentioned how the shaytan always looks to come close and catch up to us. To avoid being stuck on the same level of faith or have our faith decline, we need to continuously do good deeds to distance ourselves from him. Giving da’wah should help us to avoid his clutches as not only are we performing good deeds, we are encouraging others towards good, presenting a real blow to the shaytan. Also, if you are blessed enough to be used as a tool by Allah to guide someone to Islam then that should provide you with a warm glow inside knowing you have helped to save a person from shirk. Think about a non-Muslim neighbour or colleague you have and how you would feel if they accepted Islam on your hands with the grace of Allah . Again, it is worth thinking about that person and if they died in that state of disbelief. As Muslims, since we know where those that disbelief will dwell forever, would we wish that for them or any of the non-Muslims around us? Who would know better than Our Creator about what is success and those that are successful? This would occur through the good deeds committed by others as a result of the knowledge you have passed on. This can be knowledge you pass on to your children, for example how to make wudu. Also, the knowledge you have passed on to a non-Muslim who has reverted as a result of your da’wah will offer enormous rewards In sha Allah. Think of the following situation: you give da’wah to a non-Muslim friend who at the age of 19 or 20 becomes a Muslim with the guidance of Allah . After a few years, that friend may settle down with another Muslim and In sha Allah have children who are raised on this deen as well as themselves having a long and pious life. Then a portion of the reward achieved by all these individuals would come back into your book of deeds. It does not stop there because this friend may become a scholar, or his/her children may become scholars or they themselves may invite many others towards Islam. In sha Allah, all of these actions will find a portion of the reward into your account for the initial da’wah you gave. We know about the uncertainty of death and our short stay in this world. Unfortunately, some people miss the opportunity to do good deeds before passing away, after which it is too late to go back. This requires us to make an investment now for the hereafter so that we pick up good deeds in the grave even when we physically do not have the capacity to do good deeds. We understand as Muslims we will be asked about how we lived our lives e.g. whether it was in obedience to Allah or not. We are also going to be asked about the knowledge we possess, which can include basic knowledge such as the shahadah. Dear Brothers and Sisters, the different points mentioned are just some of the benefits of being involved in da’wah. It is also worth reflecting on the potential pitfalls of neglecting this important duty. A point to consider is that with so many statements relating to da’wah, they provide strong evidence about the importance of da’wah to Allah and how it should also be a feature in our lives. In my next article, I will discuss how we can do da’wah. What other benefits can be achieved through taking part in da’wah? If you are involved in da’wah, how has it impacted your life? Please share your knowledge in the comments section below, so we may inspire one another to take part in this blessed act!